Rains rot the rafters and do you just have to snore? Is that mouse playing football, oh, I thought they didn't like the light? Oh, woe is me! Today I have been experiencing the first hangover I have had in many's the long year. Of course, it's my own stupid fault. Yesterday began well. A lie in and then down to the residence's little tropical garden where I had breakfast by the pool whilst reading "The Bangkok Post". The owner of the place - "Staborn" - speaks English better than any other Thai I have met - probably because he spent years working abroad for the national tourist board. We chatted for a while. Later I hailed a taxi bound for Chatuchak Weekend Market - a vast, sprawling market with hundreds of stalls selling just about everything under the sun. I bought three things - a bag for my laundry, lunch and a model tuk-tuk made from a Singha beer can. The young woman who made these ornaments told me it took around three hours to make one and watching her work, I could well believe this. My little tuk tuk cost me just over £3. Then I wandered through Union Mall with its throng of young shoppers pursuing their unfathomable clothes hunting hobby and onwards to my appointment at the dentist's torture chamber which I left after an hour minus the root of my previously crowned front tooth and about £100 which I had to pay for a brand new dental plate. Fingers crossed, it feels very comfortable. Back at my room I contacted Jon's wife - Denise - to check on arrangements for the evening. We caught a cab together, then the Skytrain, finally arriving at an English pub called "The Bull's Head" - filled with ex-pats. I had my first beer at 8pm. At midnight I was watching the England v France rugby international live from Twickenham and fool that I am, I know I should have made my way home straight after the final whistle. But there was more beer and then a short walk to a late night bar where I played pool exceedingly badly. Finally, at 4am, I decided I had just had enough. 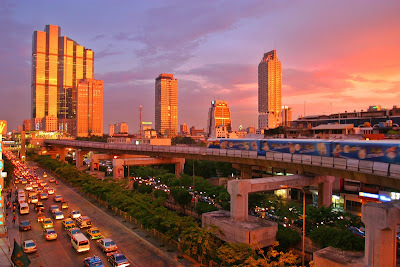 With help from one of the other teachers at my school, I caught a taxi back to north Bangkok and remember, very vaguely, staggering homewards across a footbridge, putting my key in the lock and collapsing into bed. Will serve their country with pride and prestige-full of victory. As I was sitting at the computer in my air-conditioned classroom at 7.30am this very morning a smiling student knocked on my door and came in solely to give me a sweet. 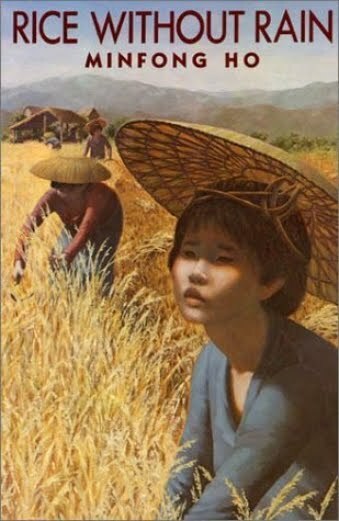 Later, I announced to my Year 9 class (fourteen year olds) that I wanted their exercise books in, their copies of "Rice Without Rain" by the Thai writer Mingfong Ho and that they were to put their chairs under their desks tidily. Moments later, after they had gone, I looked across the room and saw that all chairs had indeed been put under the desks and on the front tables there were two neat piles - exercise books and novels. I didn't have to try. It just happened. In contrast, I remember two horrid fifteen year old boys I taught in my last full year of secondary school teaching in north Sheffield. Martin and Louis were always late for lessons. Every time I challenged them they became surly and obstreperous, snarling back: "Nobody else bothers if we're late" or "What ye going on abaht?" or "We're only five minutes late - ger over it!". Louis never had a pen to write with. Getting work out of him was like getting blood out of a stone and his arrogant chum Martin was not much better. Their body language spoke volumes - rocking on their chairs, failing to sustain polite eye contact. I wrote to their parents, kept them back for detentions, reported them to the Senior Learning Mentor - all to no avail. Both of these boys had plenty of latent ability but they had chosen not to nourish it. I'm not saying that all secondary school children in working class urban areas of Britain are like Louis and Martin. Many youngsters remain polite, focussed, willing and grateful of the help you give them. But there is a boorish and influential core of reluctant, argumentative and downright lazy kids who seem to do their best to turn education into drudgery. It should be happy, enlightening, pleasant. Being in Thailand reminds me that it really can be that way - adults and young people working together in an atmosphere of mutual respect, feeling a sense of joy about the very human business of learning. When I was fourteen, I was keeping wicket during a school cricket match. The bowler was a natural athlete called John Hawley who later went on to play football professionally for Hull City, Leeds, Arsenal and Bradford City. Anyway, the batsman moved across the line of the advancing ball which must have hit a divot and therefore rose at an unexpected trajectory. My gloves were too low and the ball hit me square in the mouth. My front teeth were broken and my cricket whites were bloodied. The legacy of that moment has been with me my whole life through. One of the teeth that was saved had lost its nerve and as years passed it darkened so that I became quite self-conscious about my smile, often consciously hiding my teeth. Anyway, about three years ago, a Polish dentist who I would gladly pay to have hunted down by hired hitmen, persuaded me to have the darkening tooth crowned. Foolishly, I trusted in her professional expertise. She made a pig's ear of it so that a few months ago my new NHS dentist said that the "crown" she had fitted would have to go and an attempt would be made to fit a new one. But this new one kept coming out. I returned to the dentist several times to have it re-cemented. In the end a third crown was made and fitted just before I came to Thailand. However, last week, probably while snorkelling, the third crown loosened and I ended up marching in to a Thai dental surgery. Amazingly I got an appointment that very day. The Thai dentist a Dr Chalermpong Tungvijtsakun DDS (Chiangmai University) investigated my dilemma and deduced that the crown was not going to work out as the receiving root was fractured. I would need a false tooth adding to my front plate and the remaining root would have to be extracted. In the meantime, he temporarily glued the old crown back in and told me to be careful with it when eating. A new appointment was fixed for this Saturday. 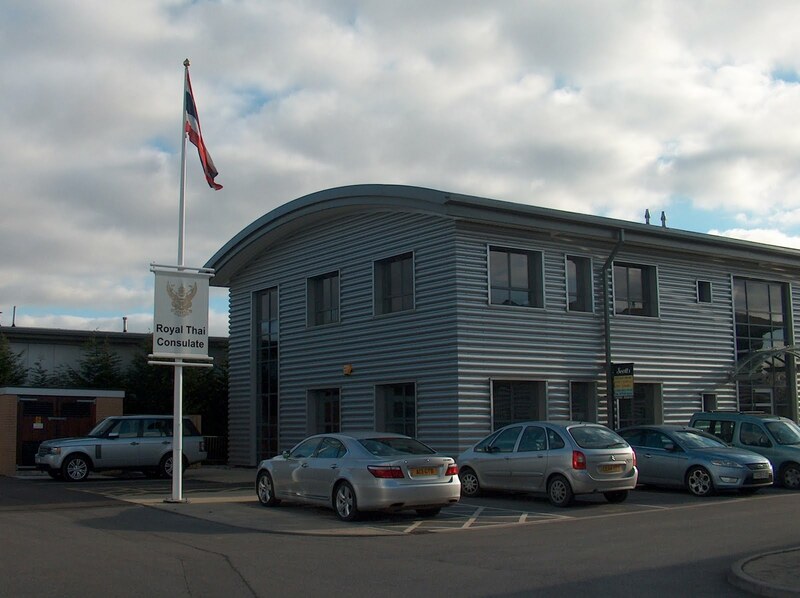 On Monday lunchtime - my first full teaching day at the international school - the damned tooth came out again. I popped it back in in the men's lavatory. I had a class in the afternoon - twenty one bright fourteen year olds. My first announcement to them was that I was having a problem with a front tooth and they were not to be too surprised if it dropped out. On cue, the thing came out again. The children giggled but it was not in a mocking, nasty, uncaring teenage manner. They were very kind and forgiving about it and I was able to continue straightaway with the lesson I had planned. Later I thanked them for their kindness and respect. By the way, reflecting once again on bizarre Thai nicknames, there are two boys who sit next to each other in this class - the first is called Two and his deskmate is Ply. I kid you not. Another boy is called simply "P". Their kind reaction to my front tooth issue gave me the confidence to march to school today with a toothy gap that I didn't give a damn about. It probably gives me Tysonesque street cred. Grrr! I guess that most "tourists" in Bangkok will rush around to see as many sights as they can in the short time they have here. Luckily, I don't have to rush. In my four month sojourn, I can make several leisurely visits into the centre of this great metropolis and explore it at my own pace. This morning I struck out alone. Taxi to the nearest MRT (Metro) station and then I was swished onwards to Hualamphong in a sleek carriage where I was the only visible westerner. Emerging into the heat, I wandered down to the Chao Phraya River and boarded a ferry bound for Tha Tien. After buying a drinking coconut, I found my way to the Wat Po temple complex. The main attraction here is the famous Reclining Buddha but the grounds of the complex are also quite wonderful to behold. I read that the temple was famous for providing a professional Thai massage service. I paid £5 for half an hour of being squeezed and bent but no**, this massage did not have the "happy ending" that sleazier establishments might provide! **I had already guessed what some of my readers might be thinking! John Gray, Mr Parrots etc..
After some money grabbing git had scribbled with a ballpoint pen on my pristine map of Bangkok, I wandered into the chaotic ambience of Chinatown with a million merchants plying their wares down cramped alleyways and sweaty side streets. How the hell they all make a living, I have no idea. On one particular street I saw numerous women sitting in deckchairs, their faces creamed white as "beauticians" threaded away unwanted facial hair. In another street there were florists after florists - dozens of them. Nobody was pushy, pouncing on you just for stopping to look. Again the only westerner in a vast commercial floorspace with Chinese tea shops and eateries, I managed to find the humble Peking Restaurant with its promised English menu and ordered, with some difficulty, a beef and spinach noodle soup with steamed "lice" on the side. Delicious and healthy too. For dessert in the street I bought a plastic cup crammed with big, juicy black cherries. Little activity on this old blog for a few days because after just one day in my Bangkok school, it was time for the half term break. 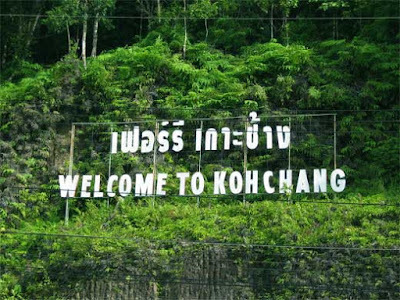 With accommodation sorted, I was able to accept Jon and Denise's kind invitation to join them on a trip down to the island of Koh Chang near the Cambodian border. It's a five hour bus journey south east of the Thai capital - but the ticket cost just 250 baht or £5.20. Once on Koh Chang, we squeezed out of the pick up truck taxi at White Sands beach and started to look for accommodation but what we saw at first was either too up-market or too down-at-heel. We trudged to the northern end of the beach and there we found the White Sands Resort which I had spotted last weekend during an internet search. This was the Thailand of my imagination. Thatched beach huts. No traffic. A lovely warm sea. Thai masseuses under palm fronds and a white goose called Colin patrolling the littoral. Better still there was a wooden restaurant right on the beach serving exotic Thai fayre. It was like stepping into the cover of a faraway holidays travel brochure even if there was a gecko on the shower room ceiling and a musty smell in the bedroom - probably because the hut was sealed against mosquito invasion. No opportunity to refuse. It seems that in Thailand, companies, private schools and the like insist that their employees are given thorough medical examinations. So it was that at 7.30 this morning I could be seen marching by the endless flow of traffic, past the stinking canal and the sleeping dogs, under the concrete flyover and onwards to the school campus where I met with the headteacher's PA and the school driver, Mr Chad. They were taking me to a company clinic for the first full medical of my life. Of course there were many forms to fill in. One lady in a cerise tunic took a sample of my blood. 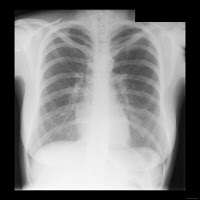 A multi-skilled gentleman had two jobs - chest X-ray and ECG. I had been told not to eat or drink for eight hours before my appointment but I still had to provide a urine sample. A starched nurse from a nineteen sixties hospital weighed me, measured my height, measured my chest and waist - about which she appeared to make some disparaging remark to the school secretary who was shadowing me all the way. Who cares about confidentiality? Then I went into a windowless office where a grey-haired gentleman was reading a newspaper. He put it down and indicated that I would need to remove my shirt (again). He asked me about syphilis and gonorrhoea but I said it was comedy duo I had never much appreciated. He donned his stethoscope and tested my reflexes and then when I was lying flat on his couch, with his ungloved hands he played around with my wedding tackle and told me to cough. I think he was disappointed that I was not ravaged by venereal disease. Then more forms and signatures before stepping outside for my eye test, taken down a corridor with other victims watching from the adjacent waiting area. I swear I almost received a round of applause when I rattled off the letters al the way down to "Printed in Thailand". It's Superpudding with his X-ray vision but his slightly raised blood pressure. Then we were out of there on our way to the Commercial Bank of Siam to set up an account. The colour theme was purple and the place was like an anthill - alive with bank workers. Outside a golden statue of the bank's founders looked down on fountains like a giant Buddha. Imagine that - a statue to bankers! Perhaps we "westerners" should follow suit and gather donations to erect statues of our own leading bankers. After all, their impact upon this planet has been err...amazing! Above,. the giant urn in my shower room. In especially warm weather you ladle cold water over yourself. Below - images of The Lotus Room - my new home at The Serene. According to the Lalitavistara, "the spirit of the best of men is spotless, like the lotus in the muddy water which does not adhere to it." Not Sleepless in Seattle but Bushed in Bangkok. This is my third night here and though I sleep soundly at first, I wake in the early hours of the morning feeling drained and frustrated that I haven't had my customary seven or eight hours of blissful, battery-charging unconsciousness. If I don't return to my usual sleeping pattern soon I will turn into a zombie, stalking the streets of Bangkok like Frankenstein's monster. Saturday was quite full. Lord and Lady Booth of Northgate accompanied me on an apartment hunt which ranged from a designer pad from a style magazine to a seedy murder scene flat with thunderous aircon and mosquitoes. A couple of the apartments admittedly had wonderful views over this great sprawling city but I just couldn't see myself in a lofty eyrie twenty two storeys up. I would have felt like a worker bee in a hive. So I am hoping that I can negotiate something with the owner of this lovely little B&B set back from the road in its little garden oasis with its little plunge pool and its copy of "The Bangkok Post" on the table in reception. The only thing is I would need to be allowed a kettle and a toaster - perhaps a microwave too - and the price would need to be right. The scale here is definitely human and its more me. Jenny at "Demob Happy Teacher" will be Couch. Malc at "The Edge of Nowhere" will be Boar. Robert at "Rhymes With Plague" will be Gramps. Daphne at "My Dad's a Chemist" will be Flipper. Brian in Catalonia will be Messi. Helen in Australia will be Wombat. Frances in Birmingham will be Me Got De Fishing Net. Ruby in St Andrews will be Mutley. Farida in Seattle will be Fantasy. Elizabeth at "Well This Int Gettin' T'Ens Fed" will be Firewalk. Katherine at "The Last Visible Dog" will be Easel. Mr Jonathan at "Bangkok Boothys" will be All Day Breakfast. and last but not least, John Gray at "Going Gently" will be Dr Dolittle. I am sorry if other visitors feel disappointed about not receiving nicknames. For a small fee, personalised nicknames will be devised upon request. 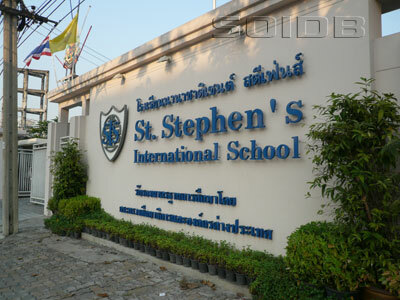 So we strolled along past the concrete flyoverand the surging seven am traffic to the urban oasis of my Bangkok International School - "Where East Meets West". What a spiffing day I have had. How sweet and respectful the children are and how eminently manageable my teaching timetable will be. I must of course be careful what I write here as it is possible that via searching others may happen upon this post. If they do I have nothing but positive feelings towards the school and the prospect of four and a half months working there seems quite delightful. I have discovered that naming practices in Thailand are very different from our own. Children have long often rhythmical formal names but they all also have "nicknames" which is how their familes, friends and schoolteachers know them. Names I have encountered so far include: Poo, Mark Hughes, P, Gabby, Trust and Do. Brilliant! If I were to have a Thai nickname it would be either Tiger or Tetley. Tonight I am going into the centre of Bangkok for a few beers with John and "the lads". Just had a refreshing swim in the Serene's serene little pool. The heat is so thick you could chew it. Hello Loved Ones! Well here I am in the Serene B&B in Bangkok. 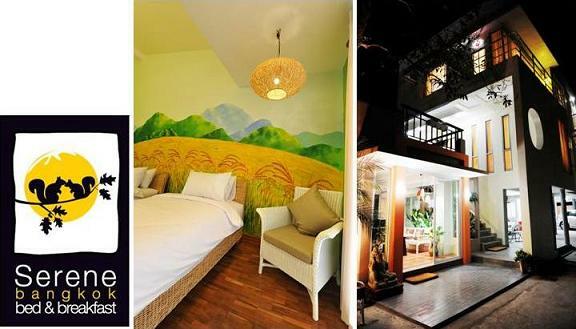 My room is the Ricefield Room. There are two huge pastoral murals painted on the walls depicting rural Thai life. In the shower room there is a massive ceramic urn filled with cold water but there is also a warm shower. The bed is like a huge basket. John and Denise were waiting for me at the airport. There was a delay at Dubai because of fog. Last night we strolled through the sultry heat past the concrete flyover and the petrol station to a bar with live miked music. I had a large beer and a lovely little chicken noodle dish with iceberg lettuce. I woke far too early. I am meeting John and Denise at 7am for the fifteen minute stroll to the school. I have a full day and will no doubt have a lot to learn. It's 6am now and already I am thinking - thank heavens for air conditioning! Written at the internet station in the lobby. I haven't got a wifi password yet. So many television channels and often there's nothing worth watching. Celebrity this and celebrity that - am I the only one who is sick and tired of frigging celebrities? Tedious gameshows and comedy programmes that don't make you laugh. Politicians being harangued. Canned laughter. Cynical commercials. And then from the midst of all this utter tripe emerges something quite breathtaking, quite wonderful, the BBC's "Human Planet". We are halfway through this superb eight episode portrait of how the human race adapt to different environments. So far oceans, deserts, the frozen Arctic and jungles have been covered. Next will come mountains, rivers, grassland and cities. The camerawork has been quite stupendous and the gentle pace of each episode has allowed better absorption. John Hurt's understated and intimate commentary has assisted that absorption process, as has Nitin Sawhey's discreet musical embellishment. The series took two years to put together and shows us in technicolour close-up the lives of around seventy different earthlings. For example, sitting quietly in a dug out canoe off the coast of New Guinea, we met a patient "shark-whisperer" who drew sharks up from the depths simply by rattling shells in the water. When the shark finally appeared, he drew it into a noose which had a wooden float tied to it. No matter how hard the shark struggled, it remained trapped on the surface and finally when tired out it could be taken from the water. This old man seemed like the last in a long line of tribal "shark-whisperers" and reflected that shark numbers had declined enormously since he was a boy. 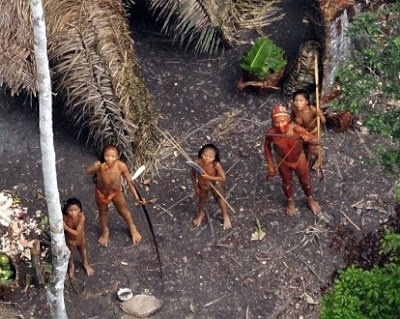 In "People of the Trees", we met the naked Korowai people of Papua. Like the BBC crew, I watched in awe as the community made a huge treehouse high in an ironwood tree - some forty metres above the forest floor. In two weeks this amazing edifice was finished and the whole community climbed up into the clouds with babies and pets, food and fire. Why did they do it? To escape from insects and mud and the attentions of other tribes and simply because they could. These people lived in harmony with nature, their lives little changed from their ancient forefathers' ways. I have often been overwhelmed by a sense of loss when viewing "The Human Planet". Just as shopping experiences in the developed world are becoming homogeneous so tree-house builders and shark-whisperers are disappearing - being absorbed into the general samey throng with T-shirts and celebrity TV and dirty banknotes. In the last programme we saw distant glimpses of small Amazonian communities that have never had any contact with the outside world. They live as "noble savages" in the heart of the great rainforest, the true kings of the jungle and yet for how much longer? 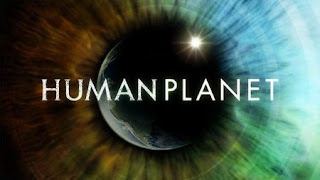 "The Human Planet" - television and human beings at their very best. 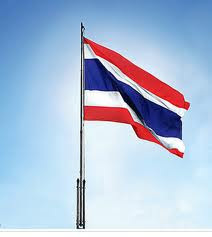 By Thursday night, I shall be in Thailand. From first agreeing to take up the work opportunity, time seems to have flown by. What was once just an idea is now very much a reality. 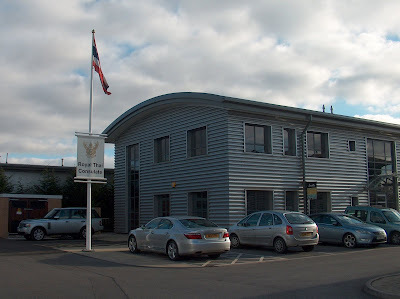 A few days ago, I drove over to the Royal Thai Consulate on the western edge of Hull to acquire my work visa and I have had my typhoid and hepatitis B jabs. At "Matalan", I bought three short sleeved shirts and two pairs of trousers suitable for schoolteaching. My Emirates flight from Birmingham is booked. I shall be leaving on a jet plane on Wednesday evening. With a luggage allowance of just 37kg, I shall be struggling to pack enough stuff to get by. It's all pretty exciting but other feelings are also swirling in my mind. Life with Shirley in Sheffield has been good these last few months. I will miss her and my peaceful, unflustered existence. I will miss the local pub and my quiz mates - Mick and Mike and I will miss watching Hull City who seem to have re-invented themselves and could be pushing for the Championship play-offs again this season. I shall miss my vegetable patch and the gradual emergence of plants one can eat. But one thing I know for sure is that if I had declined the opportunity, I'd be forever kicking myself. Sometimes, when you meet a challenge, you just have to to take it. Besides, by all accounts, teaching in Thailand has many pleasures - no OFSTED inspectorate, no league tables, high levels of trust in and respect for teachers, children who want to learn because they know that education will be their key to a better future. Towards the end of my teaching career proper, I was utterly fed up with pompous hangers-on who were handsomely rewarded for passing judgements upon schools without even meeting the children that their judgements revolved around. And I was sick of children without bags or pens to write with, children who seemed to resent any interruption of their social tittle-tattle. In these senses, I am sure that teaching in Thailand will be really refreshing. Long-term readers of this blog will recall that I have no religious beliefs whatsoever but nonetheless religion fascinates me. 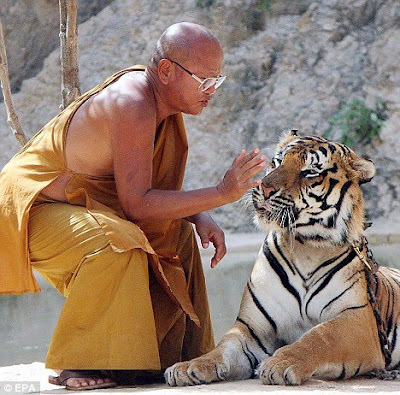 In Thailand, I will certainly learn more about Buddhism and what it means to live a Buddhist life. Where ever I go I shall be looking, looking at the birdlife, the sea, the urban chaos of Bangkok, lizards on rocks, the falling of rain through a jungle. It will be an adventure and I am almost ready to go. So there I was standing in the kitchen of our son's terraced house. Something caught my eye outside in his little urban garden. It was a bird, a beautiful bird and it had paid a visit simply to gobble a couple of rosehip berries from the bushes near the garden wall. I observed it for perhaps ten seconds and then it was gone. I may have seen such birds before without really noticing them but I have never seen one in our own much larger garden. This morning I visited the RSPB website and checked through their "bird identifier". After a while, I found my beautiful feathered friend. 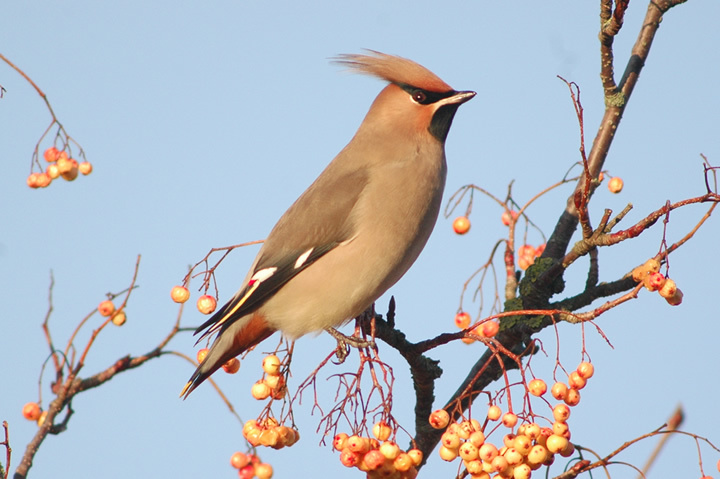 A waxwing! Like the fieldfare, another winter visitor to Britain, escaping from the cold of more northerly climes. It seems they are rarely seen around Sheffield - mainly sticking to the east coast - but my waxwing seemed happy enough gorging himself by the garden wall. You can't help but feel a little envious of creatures like that - living freely despite man's best efforts to unhinge the natural order of things.